Sadly, Congress has chosen lobbyist money over kids’ health again, but at least the mainstream media is reporting it with headlines like “Pizza is a vegetable”. Of course, we scoff when we hear such nonsense, but I can’t help but think of our homemade pizzas that are loaded with vegetables. Unfortunately, that is not what is served in schools across the country. Earlier this year, the USDA issued new dietary guidelines for school lunches based upon recommendations by the Institute of Medicine from 2009. School districts responded with large districts, like LA Unified,showing how it could be done. Last month, my own little district passed a new board policy outlining healthier school meals, as well as supporting school gardens and farm-to-school programs. Now, in an effort to weaken the new standards for school lunches, GOP Representatives want to classify pizza as a vegetable since there is tomato paste on the crust. The GOP feels schools are “overburdened” by the new regulations, but truly our representatives are caving into lobbyists. By providing children with healthy food, the government is not telling children what to eat. They still have choices, but changing lunch menus to healthier choices is the point. School lunches are subsidized by the government. We are footing the bill for many school meals on the free and reduced lunch program with our tax dollars. I, for one, don’t want my money to be contributing to health problems like childhood obesity and diabetes because of lobbyists! Nutrition advocate Margo Wootan of the Center for Science in the Public Interest said Congress’s proposed changes will keep schools from serving a wider array of vegetables. ‘They are making sure that two of the biggest problems in the school lunch program, pizza and french fries, are untouched,’ she said. 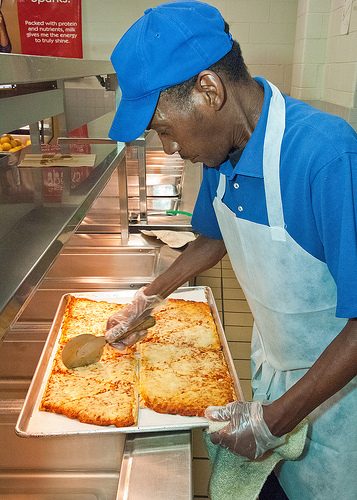 Our children deserve healthy food at school. Politicians state education is a priority, yet they fail to see the connection between diet and learning. Our children deserve better. I can see a pizza, if it is loaded with the vegetables – but Pizza a vegetabe, because of the Tomato Sauce? Come on, Ladies and Gentlemen – most of you grew up, either in the Dirty Thirties, or during the World War 2 era, as I did. There was a vegetable garden out back, and woe betide anyone who messed with those vegetable befoe they were ready to eat – came to quick wallop to the seat of the pants – remember? I like pizza as much as anyone – Shrimp and pineapple -YUM – But,I ate a lot of either some other vegetable or all the fruit I could get into myhot little hands. I don’t have a garden – I live in an appartment, with a beautiful view – and space for a large tomato plant, some lettuce (Bibb), green onions, and, if I get someone to put up the proper things to hold – some peas. No carrots, but garlic in around the rose bush – keeps the aphids away – and seasons my meals. And that is on a balcony 7 feet deep, by – at the longest spot- 21 feet long. The outside edge is approximately 18 feet long – and I do quite well for myself on that. You can teach children by this method – and you get the food. It’s not that difficult to dig up some space around the Track Oval, and put in some vegetables – peas, Zucchini – these two on trellises, and a few carrots, with the addition of Marigolds to reduce the insect population. Maybe someone shoud be thinking that way – and forget the “Pizza is a vegetable, because it has Tomato Sauce on it” Who thought that one up, anyway? It sounds a bit daft from this seat. Just in case – I’m a Canadian – and just as annoyed with our various government departments, as some of you are with this bit of idiocy. Please – do think about what you want your kids to grow up to be – and give them the chance – and growing some of their own vegetables will help them to think about nutrition more carefully. Thank you for allowing me the right to tell you what I think. I hope I’ve given all of you a bit of thinking to do.